KIDS had a Bloomin’ wonderful time while shopping with mum and dad at the Peacocks Centre recently, all thanks to a passing visit from one of the biggest stars of children’s TV. 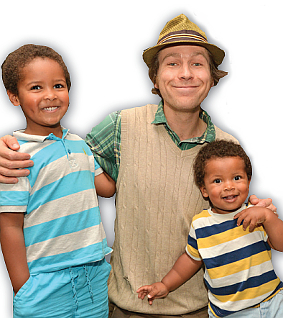 Mr Bloom, the gardening guru who keeps young minds excited and engaged with his Mr Bloom’s Nursery show on CBeebies, was in Woking at the end of last month to meet his fans. He posed for pictures and signed autographs while making a real stir. Customer Experience Manager for Woking Shopping, Rowen de Grauw, said: “Mr Bloom is one of the biggest names on children’s TV, so it was fantastic to be able to welcome him to Woking Shopping.